I always like to get a cookbook for Christmas, and I just gambled on this one when I was writing my wish list. I didn’t know much about it, but read some favourable reviews. Ultimately, I don’t think it was a gamble that paid off. The recipes are organised by colour, fitting in with the ‘eat the rainbow’ mentality, and I really like that idea. However, I found that most of the recipes I tried were sorely lacking in flavour, and I abandoned the book after just two weeks, so it’s not as thorough a review as usual. Here are the recipes I did try. 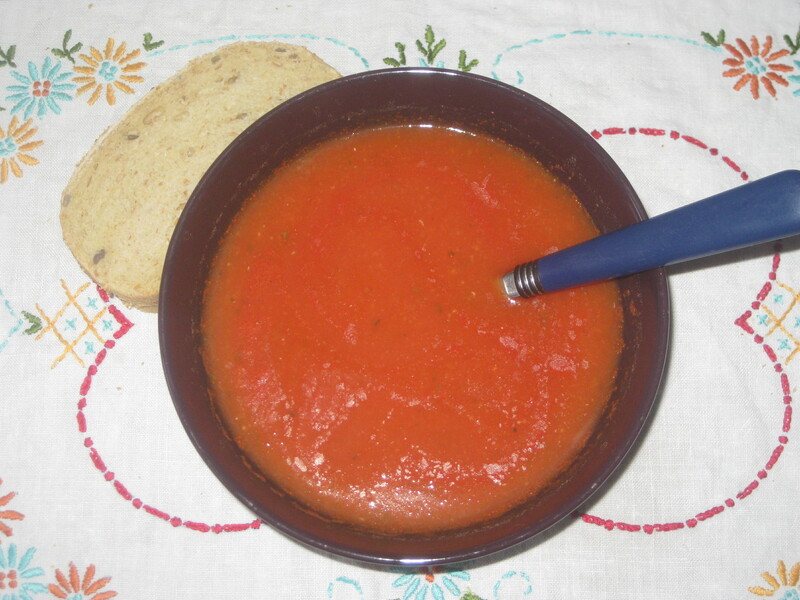 I make a tomato/pesto soup quite regularly, and this tomato basil soup did not measure up to it, unfortunately. 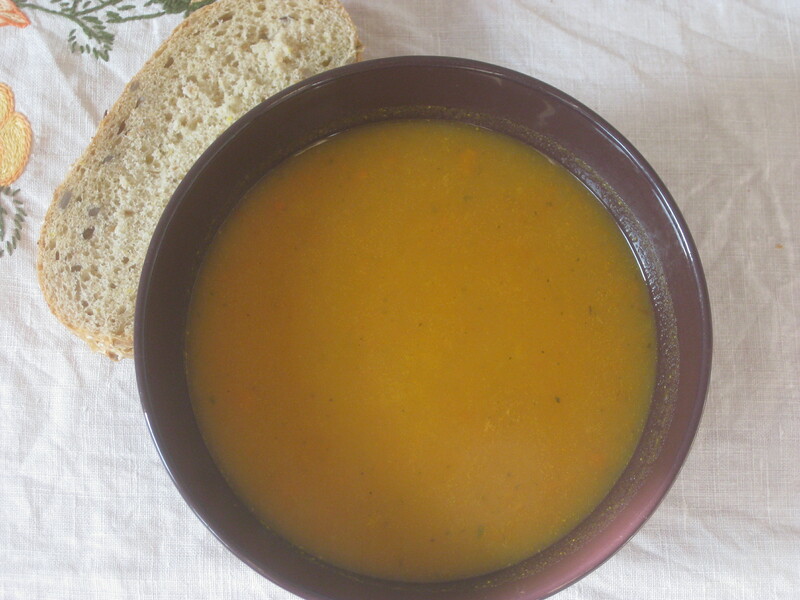 As with all the soups in this book, I found it very thin and watery – even with my own addition of some red lentils. The basil flavour was too mild as well. I’ll stick with my usual recipe. 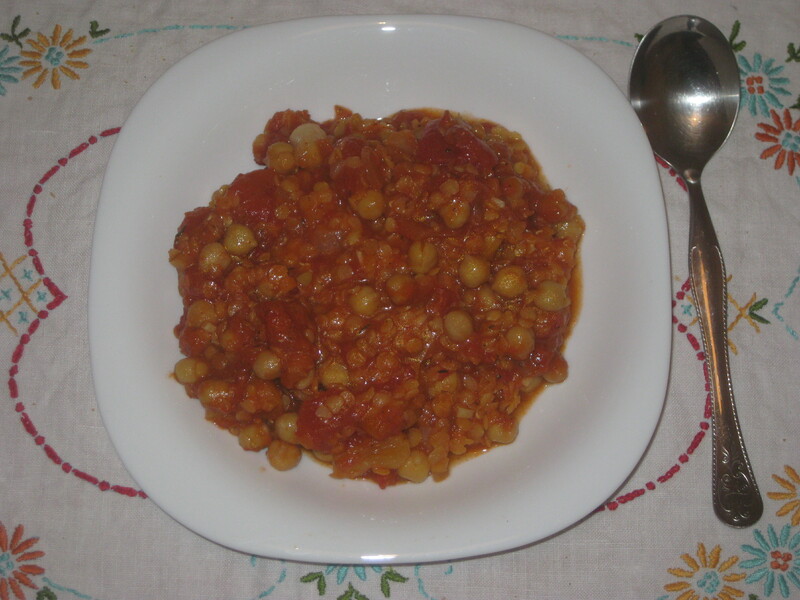 The apricot red lentil stew was always going to be right up my street, and this was my favourite recipe that I tried. I tweaked the recipe a bit: instead of chopping up three tomatoes, I used two tins of tomatoes to beef it up; and I didn’t give it the suggested partial blitzing because it looked so good and inviting as it was. I would definitely recommend it, and this is one of two recipes I will come back to. 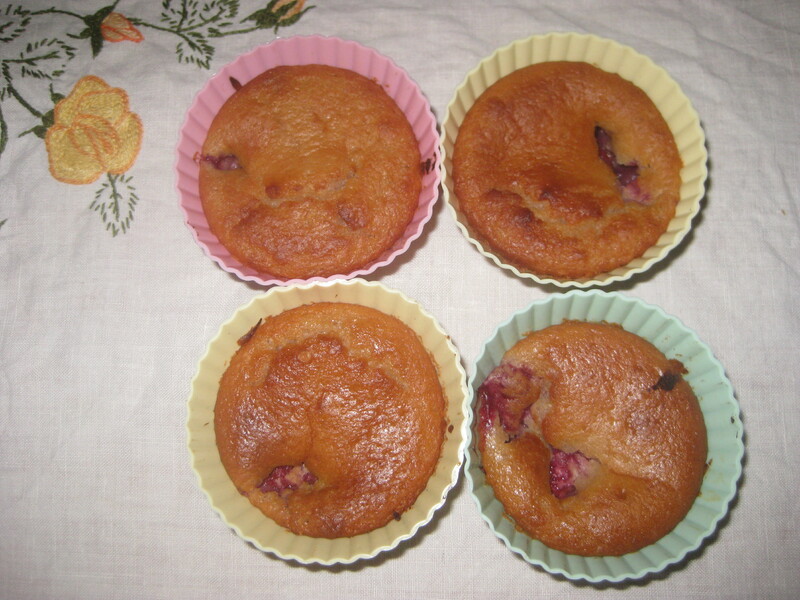 I was a little wary of these raspberry lemon muffins. The recipe calls for plain yoghurt, but says any fruity flavour can be used. The only vegan yoghurt I could find was cherry, and I was worried about how it would affect the taste. Taste-wise the muffins were fine, but all the raspberries sank to the bottom (except for a few I poked into the tops), making the sponge rather squishy. Still, they were good, fruity cakes. The carrot and roasted bell pepper soup was quite thin. It was alright – sometimes you had a nice hit of roasted pepper and thyme, but there just wasn’t enough substance to it, it didn’t pack enough of a punch. 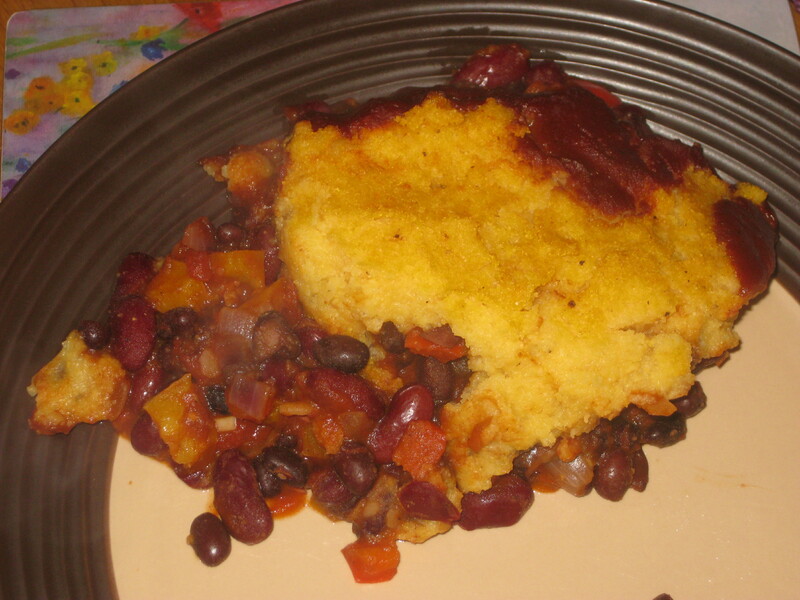 I made this hot tamale pie when I was back in Manchester for the holidays, and it went down a treat. It created a few pots and pans to wash, but it was easy to make. I used a tin of chopped tomatoes rather than chopping my own, but otherwise I stuck to the recipe. 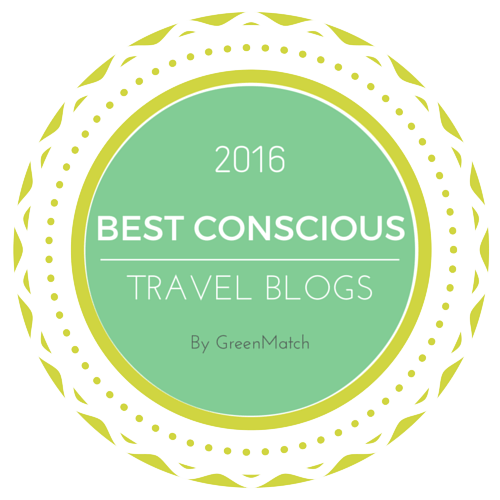 I loved the beany stew more than the polenta/cornmeal topping – it’s not something I’ve had too often, and I found it a bit weird. The dish as a whole was lovely though – like a twist on a shepherd’s pie. I added a tin of chickpeas to the curried cauliflower soup because I worried it was looking a little thin (it’s been a very cold month in Prague, and we needed some proper thick, wintry soups to get us through). It was nice, but unremarkable – the apple was overwhelmed by the curry powder, and I have better cauliflower soup recipes up my sleeve. I’d given up before I got to my earmarked recipes in the green section. 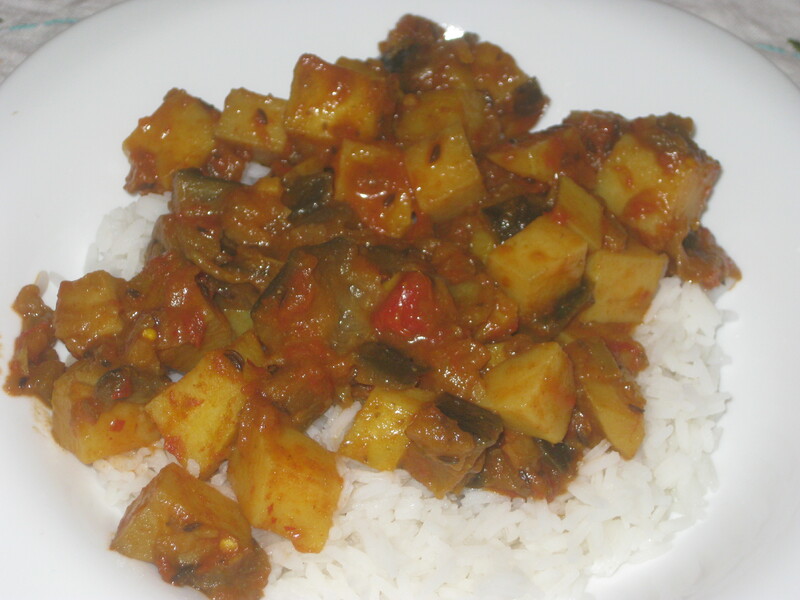 Potato and aubergine curry is a classic in our home, as both Dr HH and his mum make a cracking version of it. Maybe it’s unfair to hold this one up to the standard of an Indian woman’s own recipe, but let’s just say it wasn’t as good. The parsnip soup tasted far too sweet when I first sampled it while cooking, so I threw in lots of salt and pepper, some chilli flakes and some ground ginger to complement the chopped ginger already in. Then it just tasted of ginger. This was perhaps the first meal ever that Dr HH and I just could not eat. Maybe I got some measurements wrong or misread the recipe, but it was just bad. I wasn’t sure what to expect from the banana oat date cookies, which were essentially just bananas, oats, coconuts and dates mashed together. Of course the flavour combination was solid, but I was worried about the texture. The cookies were a little crumbly and flapjacky, but I approved. This is the other recipe I intend to revisit. 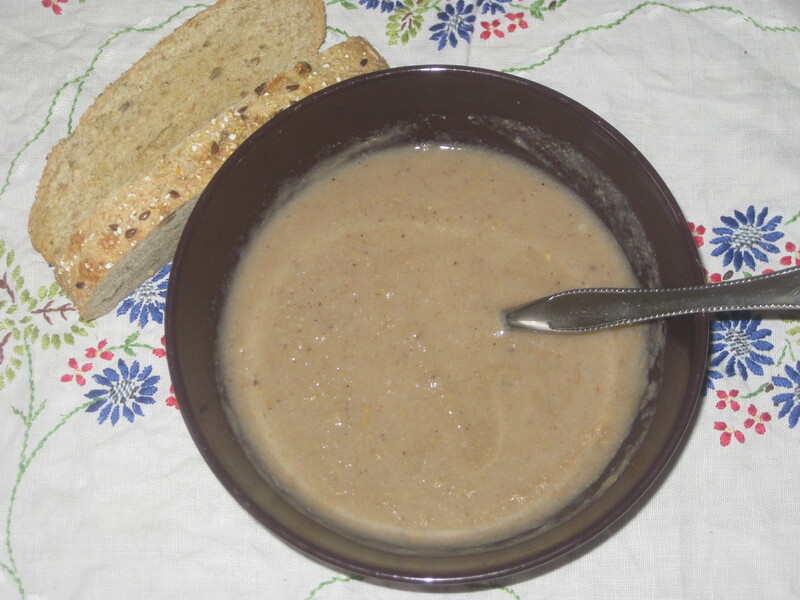 I adapted the mushroom barley soup to make it more of a stew, adding a tin of tomatoes and reducing the stock. 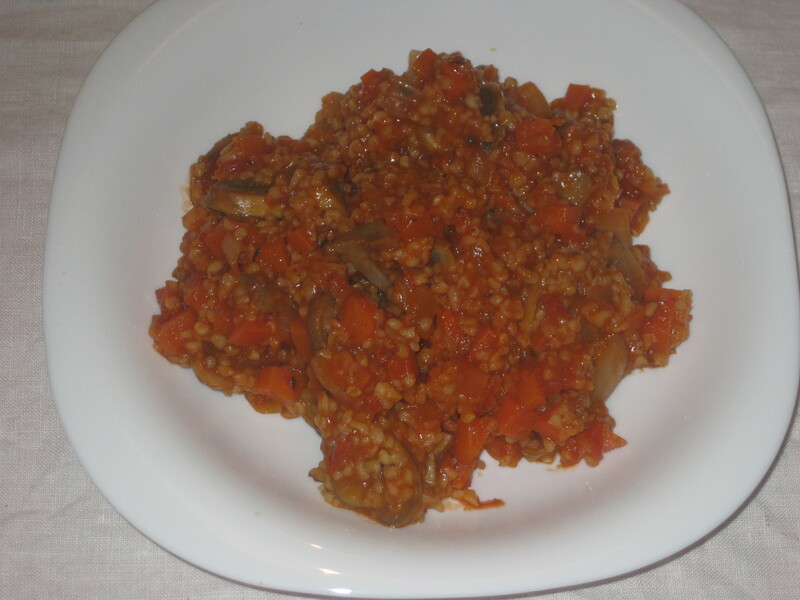 I also used bulghur wheat instead of pearl barley, because that’s what I had in. It was a tasty dish, there were some nice flavours going on. And that’s it, I’m afraid. 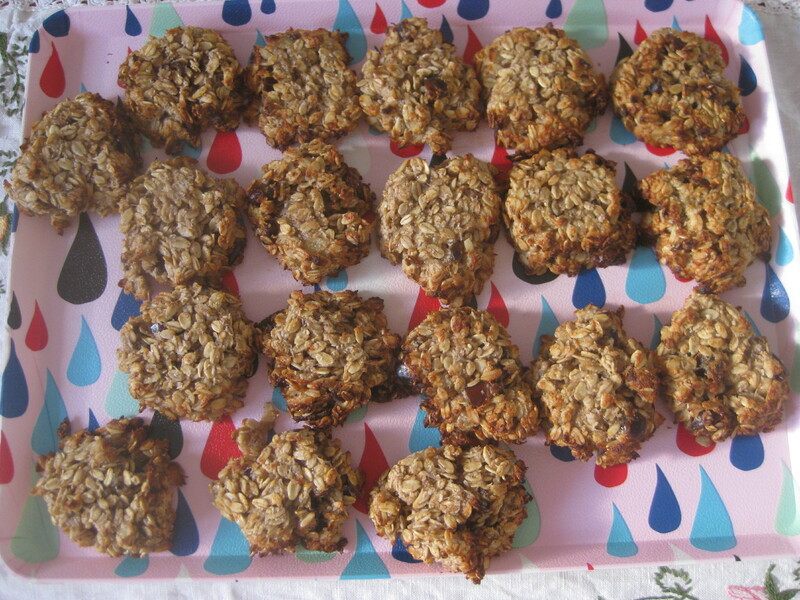 The apricot lentil stew and the banana cookies were really good, and unlike any other recipes I’d tried before. 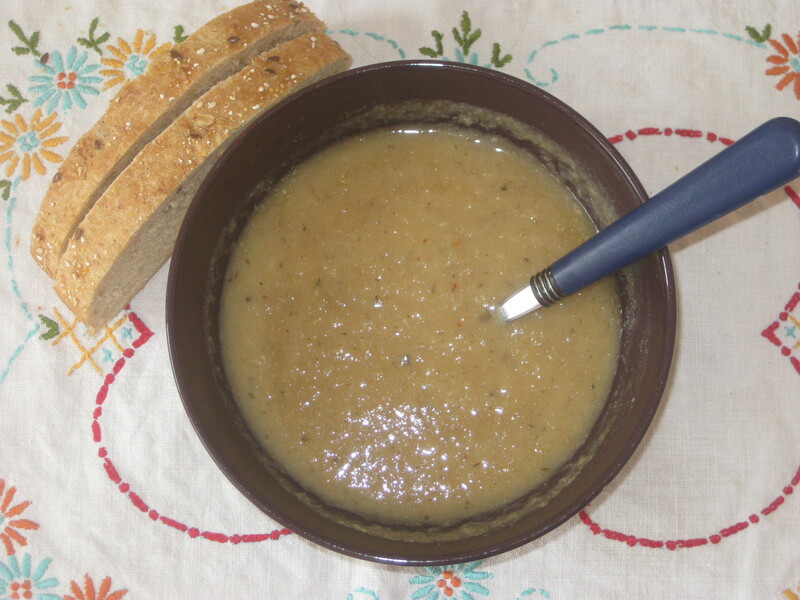 The soup recipes were all real let-downs, and as we eat soup every day for lunch this was quite the disaster for us. They weren’t hearty at all, but they also weren’t as flavoursome as I’d like. I might recommend this book to someone trying to eat healthily (and who was prepared to add more seasoning at every opportunity), but otherwise I’d skip it. 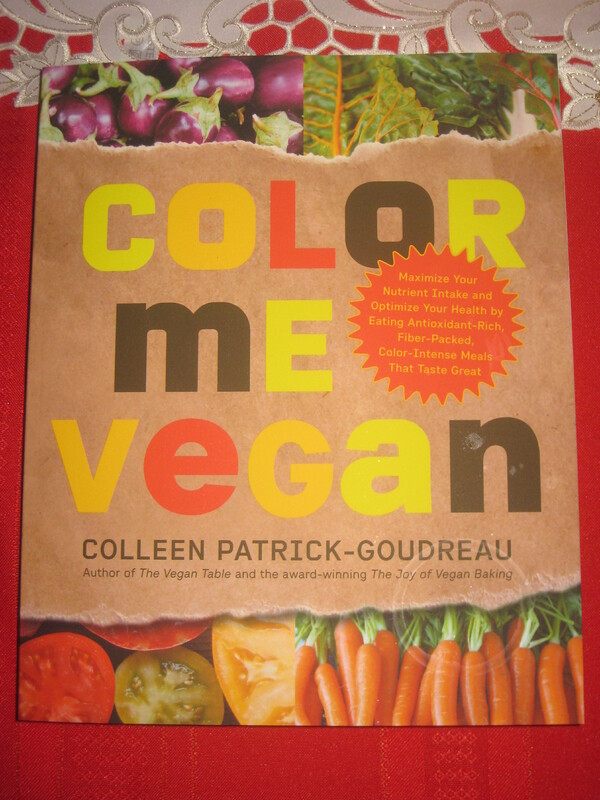 This entry was posted in Cookbooks and tagged Colour Me Vegan review, cookbook of the month, vegan cookbook. Bookmark the permalink. Ooh I can’t stand thin soup. I usually start with just half as much water as a recipe calls for to make sure it’s nice and thick. Otherwise it’s like just a food flavoured puddle. I always double the amount of veg! “Food flavoured puddle” is a good description for some of these. I’m glad it’s inspired you! Truthfully though, I think there are better vegan recipe books to get you started if you want to dip into it. Anything by Isa Chandra Moskowitz is highly recommended! thank you for the tip, I’ll search for some of their books online! Yeah, I’m not a fan of thin soup either. I have home made soup most days for lunch and it’s got to be quite hearty and filling. Agreed! It needs to give me the strength to keep going in the afternoon! What a shame the book turned out to be such a washout – you know it’s a wrong un when it tells you how to make a meal that you can’t even eat, and then causes you to give up half way through using it! It was a shame, but there are two recipes I’ll definitely make again, so it’s not a complete bust at least. I guess I am not too surprised the book wasn’t the greatest. The author is known for her youtube channel which talks about lifestyle choices about veganism, not just vegan food. Still stinks it was so so since the idea is pretty fun. I probably should have done some research on the writer first, but nevermind! The colour coordinated theme is definitely a good one, anyway.